The term “habitable planet” seems rather broad. Does it mean that it is habitable for humans? Is it merely capable of supporting some other form of life? Quite simply, planetary habitability refers to a planet’s ability to both develop and sustain life. Unfortunately, scientists have had to base their calculations for a habitable planet on Earth’s characteristics and do some guesswork. Some of the factors that astronomers look at when evaluating a planet’s habitability are mass, surface characteristics, orbit, rotation, and geochemistry. One of the most basic assumptions that astronomers make when searching for a habitable planet is that it has to be terrestrial. This means that the planet is composed mostly of rock and metal and has a solid surface. A gas giant on the other hand has no solid surface, which makes it an unlikely candidate for supporting life. Mass is also an important factor, because low mass planets have too little gravity to keep their atmosphere. They also do not have live volcanoes and other geologic activity, which helps temper the surface to support life, because they lose energy as a result of a small diameter. Planets with high orbital eccentricity – the irregularity of the orbit – have a greater fluctuation in surface temperatures because they are closer to the Sun at some points and much further away at other points in the orbit. In order to be habitable, a planet has to have a moderate rotation. If there is no axial tilt then there are no change of seasons, and if the axial tilt is too severe than the planet will have a difficult time achieving homeostasis – balance. Another assumption astronomers make when determining planetary habitability is that life on other planets will also be carbon-based. The four elements most important for life are oxygen, nitrogen, carbon, and hydrogen. With so many considerations, it is not surprising that scientists have a difficult time determining whether a planet can sustain life. Astronomers are searching for habitable planets in other solar systems too. They have started by searching in the habitable zones of other solar systems. 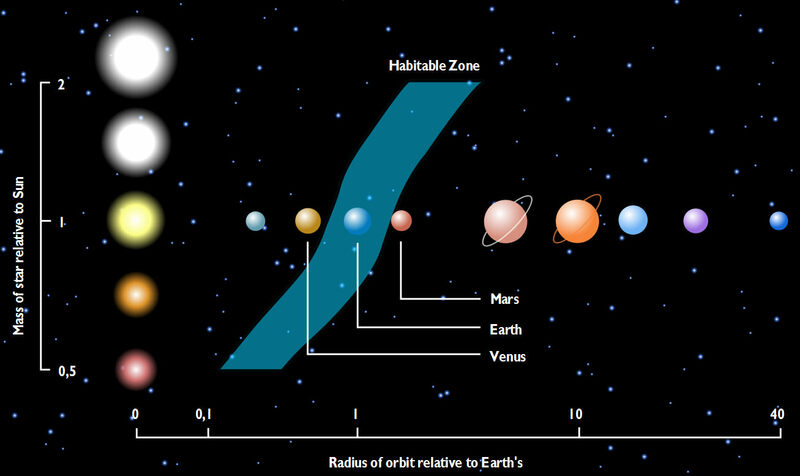 A habitable zone is the region in space with conditions most favorable for supporting life. Astronomers are unsure exactly what the extent of the habitable zone of our Solar System is. Earth is located in the center of it, but it may even extend as far as Mars, and it almost reaches Venus. The habitable zone and planetary habitability focus on carbon-based life, so they do not help predict other forms of life. Universe Today has a number of articles you should take a look at including the habitable zone and number of habitable planets. You should also check out habitable planets and habitable planets are common. Astronomy Cast has an episode on the search for water on Mars, which tells why finding water is a clue to finding life.